How do u people cuss out so easily.cant u make a comment without insults?? You that is not broke, what are you doing on a blog commenting like a fool ???? I really wish Tiwa can give him a second chance..don't we all deserve one? She should not even dare it or did u not read the story. A man who rubbishes the wife no matter what is just a boy in a man's body likewise women. I am with you on this one...but I think Tiwa is a sensible lady,she prolly has assessed the chances of him making the right choices for himself and his family and made the decision to leave . Did you hear the bit where she miscarried and he was not bothered. It takes alot for a woman to decide to spend on a man and hope he'll put his acts together. After some time of recklessness, disrespect and ingratitude, the woman will go back to the drawing board.. In as much I don’t care about Tiwa, she shouldn’t dare give this man child another chance. Who in his right senses will go out with this one. His childish posts on Instagram should give you a clue about the sort of guy he is. I think they fit each other and should consider forgiving each other. The miscarriage? Didn’t he say it was not his and she was effing around at the same time she claimed she was pregnant? Then there was another rumour that she removed it because they were seriously fighting and didn’t want another child with him. Tiwa is as messy as Tunji but she has PR on her side. I just have a soft spot for this dude. You know that likeness you have for a person. Even when they wrong, you want them to do better, they commit a crime, you want them to do the time... But you still Luhhh them. Dunno if I am making sense🤦‍♀️Eg: R kelly. I feel the new artist is even mimicking Tiwa's voice. This is exactly how I feel about him.I just find it hard not to like him.I pray he succeeds with the new signee. Me too. I just like him. Just like that o.
Iphie I get your angle. For me I feel sorry for him because of his mental health issues. Also he contributed so much to her career and now he’s been swept away. Poor Tunji. 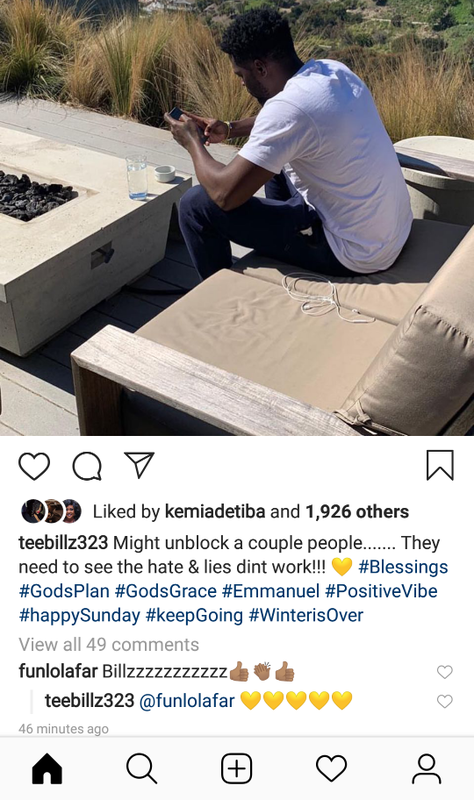 I feel so with R kelly, but i dont give 2 fucks for Teebills, he doesnt speak maturely, doesnt act maturely, what should i pity that kind person for? I cannot like RKelly and his music anymore. Yuck. Iphie, you have a soft spot for him cuz you know their story and you stay true to whoever helped you in life. If som1 helps me, except I have clear evidence that you want to kill me, I will never leave such a person.I will always have it at the back of my mind that if God didn't use the person, I may never get to that point. Kill you? Like put a gun to your head or poison you? My dear, mental torture is worse that that.......it does not only kill buy destroys your person. If Tues feels sane staying away from him, so be it. Forget about helping her........eni Olorun ran sini lo seni lore. However, we should be thankful always. I doubt those he blocked their names ring a bell in this country. E go still be all these instagram passers-by, no big deal Tee. Yes, I get. I feel that way for RKelly. I wish somehow that the stories ain’t true. Gosh!